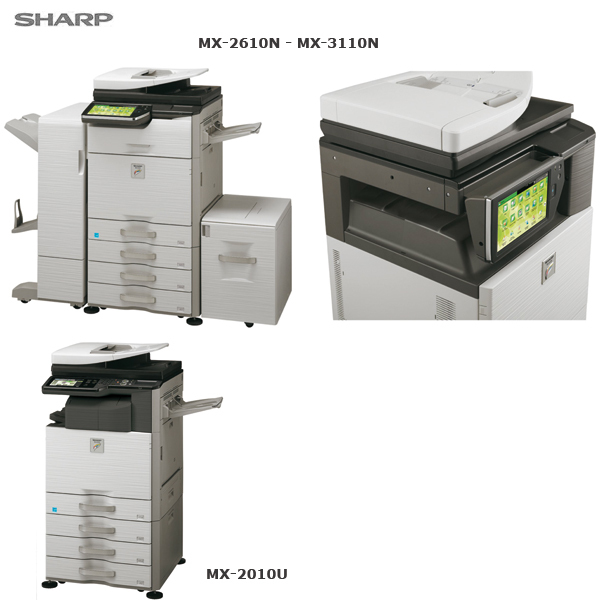 The MX-2610N and MX-3110N announced last january arrived in Europe with the new MX-2010U, the new 20ppm A3 color MFP at their sides. The 26 and 31ppm machines succeed the earlier MX-2600N and MX-3100N from this brand. The MX-2010U does not replace a particular model, though it is based on the same engine as the recent 23ppm MX-2310U and thus offers the same specific features. The brand is highlighting the new 10 inch touch screen (not available on the MX-2010U) which is adjustable like those on Konica-Minolta equiment and the latest Canons, and also the new documents server feaures. You can check out a video highlighting the new screen here or go to the brand's own site.